With May in the books, it’s official: carbon dioxide set an all-time monthly record. It’s a sobering annual reminder that humans are pushing the climate into a state unseen in millions of years. Carbon dioxide peaked at 409.65 parts per million for the year, according to data from the National Oceanic and Atmospheric Administration. It’s not a surprise that it happened. Carbon dioxide levels at Mauna Loa Observatory in Hawaii peak in May every year. 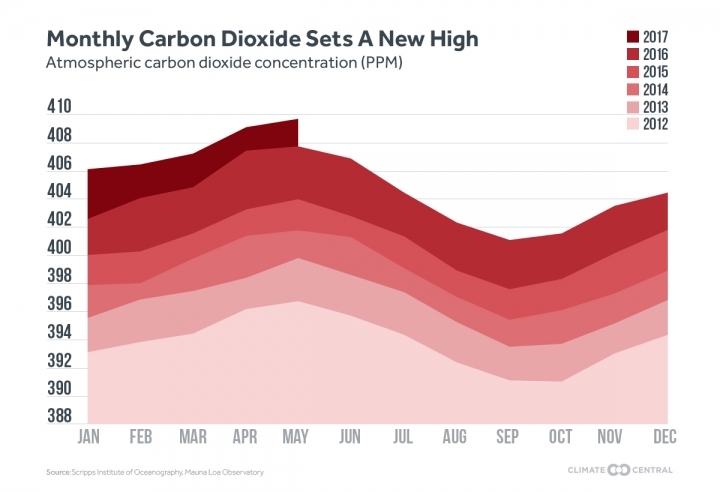 Carbon dioxide levels reached a new monthly peak in May. The news comes one day after President Trump announced his plan to pull out of the world’s main climate agreement, juxtaposing the severity of the problem with an administration that has shown little to no interest in addressing it. While plants growing in the northern hemisphere will draw a few parts per million of the carbon dioxide out of the atmosphere over summer, make no mistake, human pollution is pushing atmospheric carbon dioxide ever higher. Mauna Loa Observatory crossed the 410 ppm threshold for the first time in recorded history in April. The May average is almost exactly what UK Met Office scientists predicted it would be in their first carbon dioxide forecast. The reading from May is well above the 407.7 ppm reading from May 2016. And it’s far above the 317.5 ppm on record for May 1958, the first May measurement on record for Mauna Loa, the gold standard for carbon dioxide measurements. Prior to the Industrial Revolution, carbon dioxide stood at roughly 280 ppm. The new carbon dioxide high water mark follows a report released last week showing that last year, the world saw its second-biggest annual leap in carbon dioxide in the atmosphere. It’s second only to 2015, a year in which El Niño helped boost levels. Both years saw jumps that were roughly double the increase seen in 1979 when the National Oceanic and Atmospheric Administration started keeping the index. The rise in carbon dioxide is tipping the climate into a volatile state, one in which Arctic sea ice is scraping the bottom of the barrel, oceans are rising and causing flooding even on sunny days, and the earth has warmed 1.8°F above pre-industrial levels. As carbon dioxide levels continue to increase, those impacts will only become more pronounced. An animation showing how carbon dioxide moves around the planet. There’s a finite amount of climate pollution that humans can emit before we blow past the world’s main climate goal of 2°C. If emissions continue on their current trajectory, we’ll create an atmosphere unseen on this planet in 50 million years. Back then, the earth was 18°F warmer and the Arctic was more like the tropics with palms on the shores and crocodiles prowling the shallows. The U.S. pulling out of the Paris Agreement will likely make it harder for the world to meet a goal of staying below 2°C of warming. But some U.S. states and cities are already planning to pick up the slack created by the federal government, and there’s also evidence global carbon dioxide emissions have plateaued. Even if they have peaked, emissions still need to get down to zero to stave off the worst impacts of climate change. Until then, each passing year will see a new carbon dioxide high.